Really, orb is just a fancy word for ball, or sphere. It then makes it sound like you paid big bucks for a landscape designer. Myself, I also come across orbs/spheres in my other line of work which is to teach drawing. It IS such a complex and wonderful shape with so many hidden talents; probably why mother nature constantly uses it for her treasures! 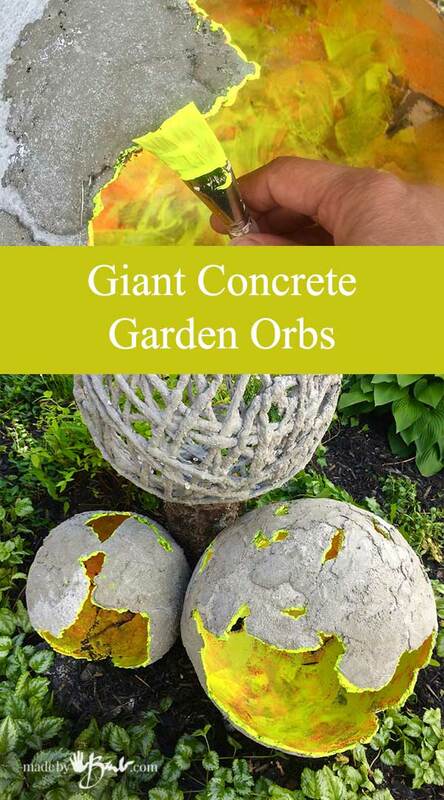 These Giant concrete garden Orbs are not fussy and simple to make with readily available materials. 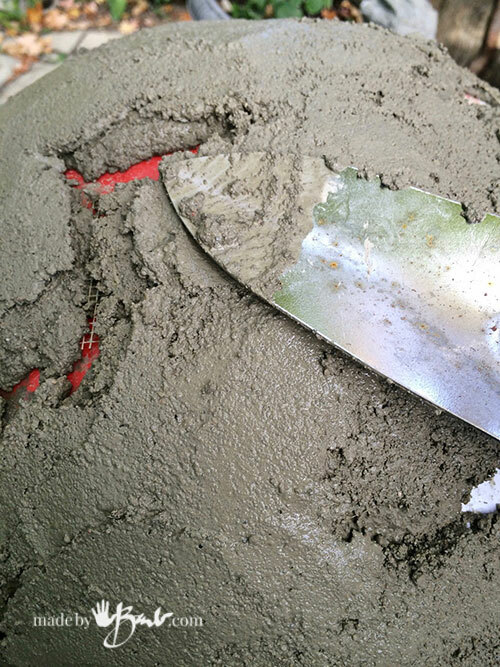 I have used a multitude of ready-made concrete mixes. It just makes things more simple! Some mixes are very economical and some are not but set really fast. This mix; also called ‘vinyl patch’ has some great qualities and these orbs have already lasted through a Canadian winter and multiple moving around. 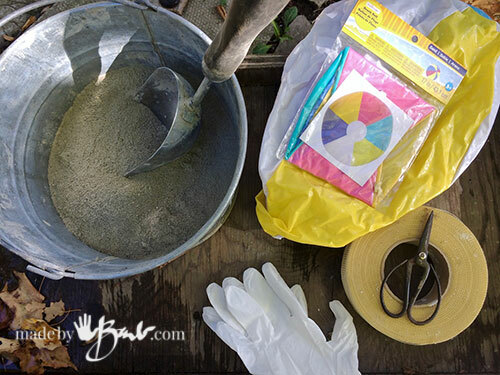 It is much easier to get everything ready before your hands are covered in concrete. Blow up the forms well, and make sure they are holding well. Last thing you need is a deflating form! I make sure they are quite hard. You will also want some resting places (buckets, pots, planters) that support the size well. It is also a good idea to weight them (rocks or even water) as then there is less chance of toppling over. Since it is difficult to unwrap the mesh tape with gloves on; ready some strips of varying lengths to have available later on. Tip: Beach balls are better that balloons! I just hate it when a darn balloon decides to pop! 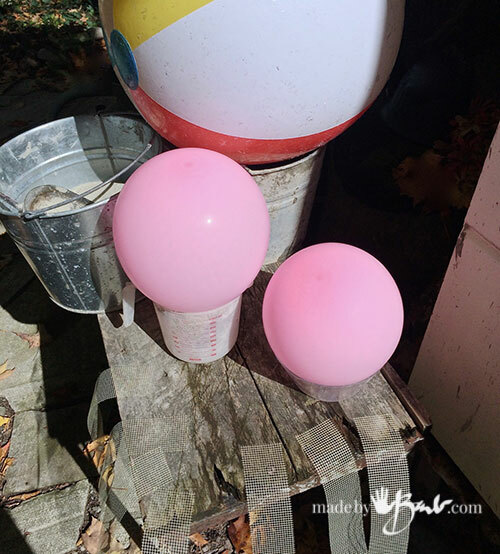 My favourite are the 20″ beach balls; they make a huge concrete orb that is still light enough to carry! Get suited up with your dust mask and gloves (apron is a good idea too). Add some mix to your container and add water slowly, mixing well after every addition. 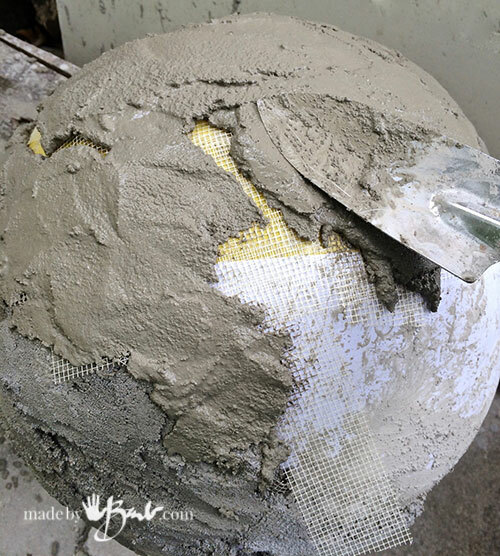 Mix slow to lessen dust and mix to bottom corners of container. The mix should not be too liquid, but hold it’s shape somewhat. Test some of the consistency by doing a squeeze test. If it holds shape pretty well then it is right. If it crumbles – too dry, runny – too wet. Don’t worry; you will get the hang of it! Remember the days of playing in the sandbox!? Well, this is much like that, patty-cake-patty-cake. Work from the top and add small sections of mix and flatten. 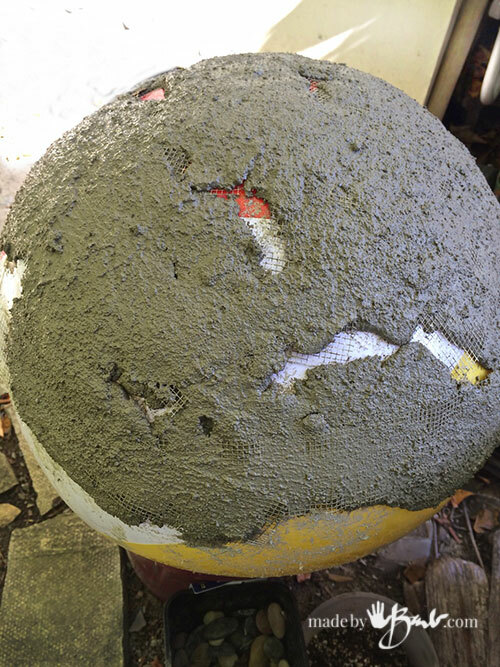 Gently patting the concrete makes the ‘cream’ come to the top and be smoother, as well as having the air bubbles release. This mix is rated for 1/2″ thick topping so that is what I strived for, however some sections may have been a tad thinner. 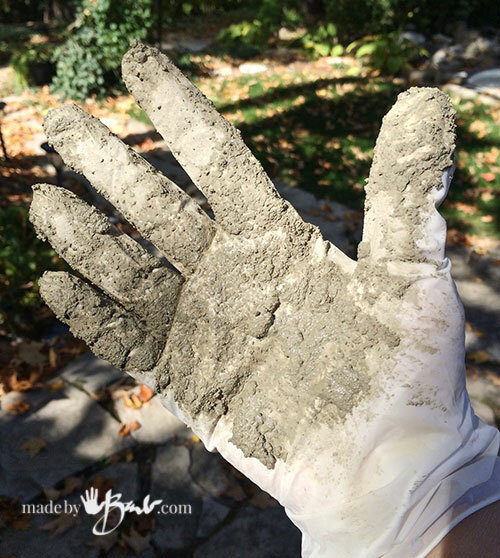 Wow, you would think I have been working with concrete for a while… yup! There are a couple of choices of using the mesh. 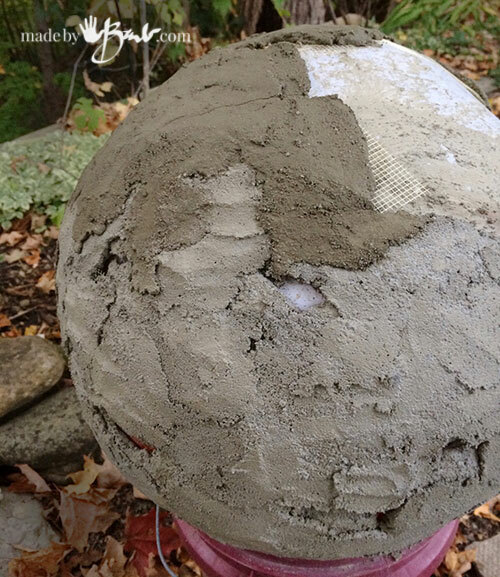 You can have it between 2 layers of concrete mix or put it on the form and then cover. I would say both methods work, however the mesh is less visible if between layers. It is not problem to have some showing as it easily cut or singed off later. The use of metal tools can make the finish smoother, if you like. Leave open areas that are quite random and interesting shapes. There are many options if you have openings, drainage, lighting, planting etc. AND they are visually intriguing! During the setting time wet down to add strength and allow slower curing. Once they are completely set, you can have more fun with them! 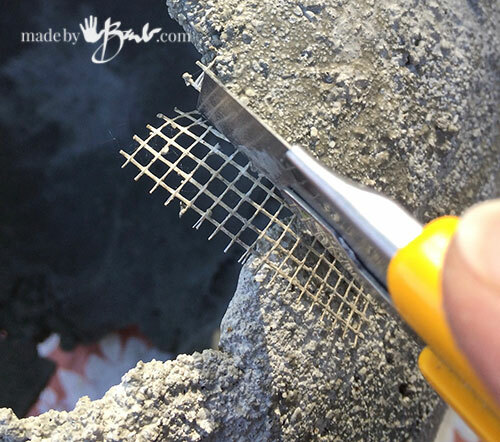 The mesh that is visible can be cut with a mat knife or singed off with a mini torch or lighter. I did find some acrylic paint that is very ‘neon’ coloured and seems to glow by itself. It will be fairly protected inside and should not be sitting in water so it should hold up well. 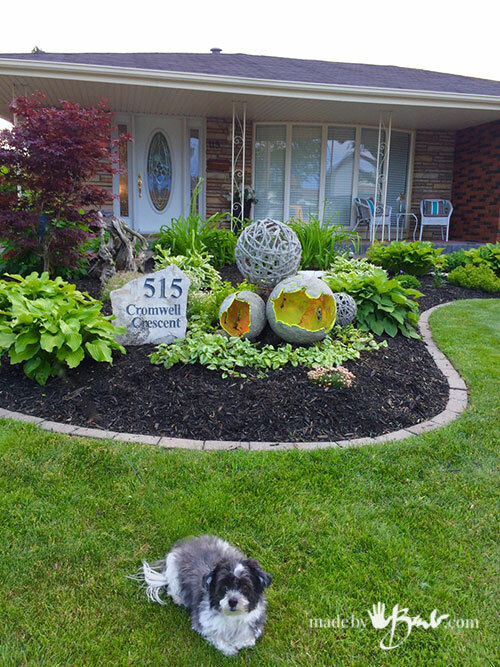 Garden design should be subtle and accent the surroundings. 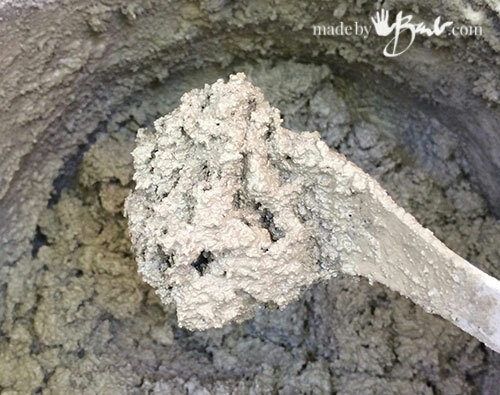 This concrete sets at a fairly dark colour and that was fine for me, as i am not a huge fan of ‘painted’ concrete. It’s the grey industrial look that is the allure anyways. 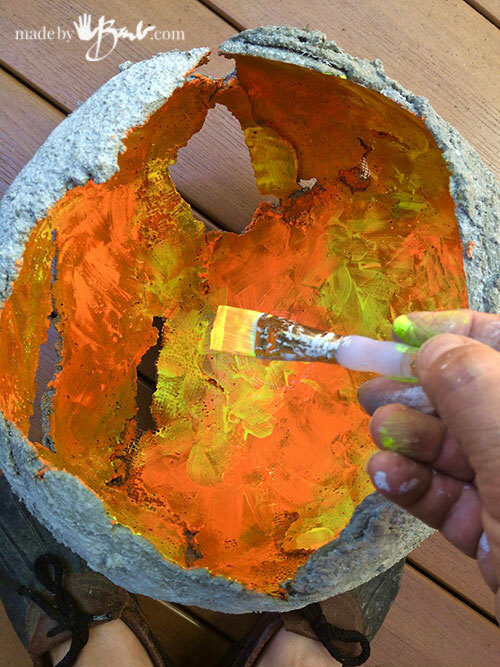 To look very random and ‘glowing hot’ inside I was purposely messy when applying the paint. Squirt some inside and then swish it around. Super-simple! and looks less contrived. 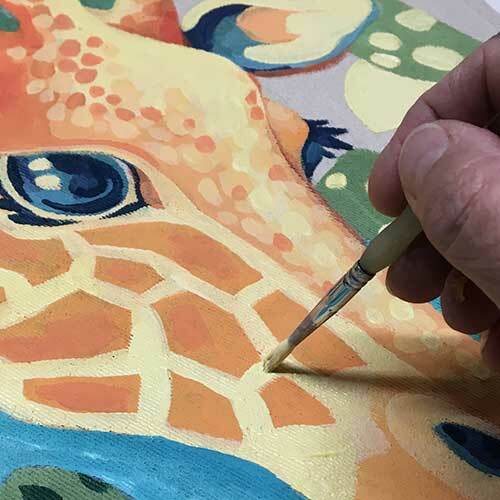 Hold the brush vertically and it will easily cover the edge with no fancy painting skills. I know you can do it! Yes, my deck is full of balls… but that is all for a reason. 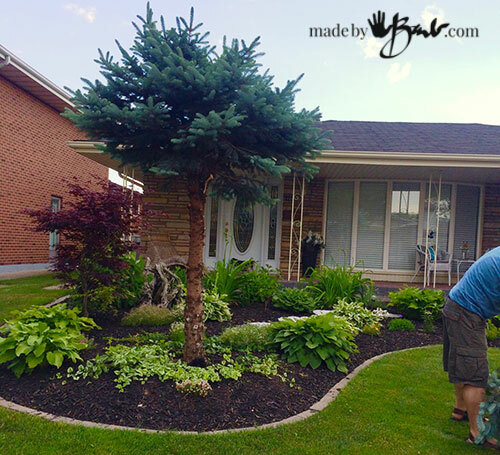 Remember the garden makeover? Well, the birds finished their nesting in the tree (yes I had to wait) so it could now be cut. I brought a bit of muscle power… I decided against the monumental task of digging out the roots. They will decay and I will use the stump for a pedestal! Design works well in odd numbers and sizes. 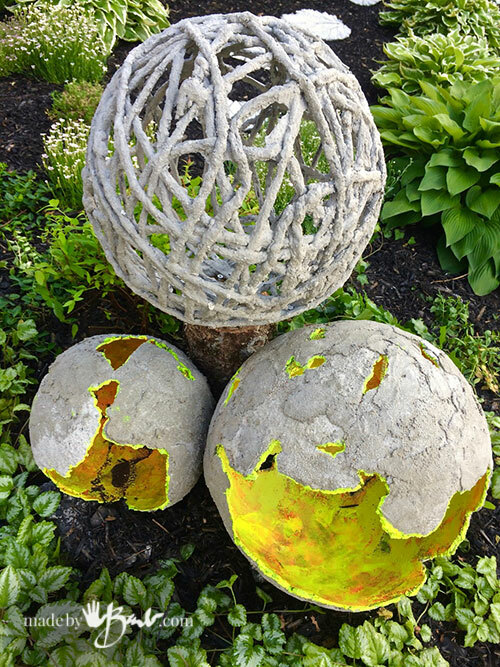 The top concrete dipped yarn orb is a nice compliment to the others shape since it is lighter on the eye with all the negative spaces. 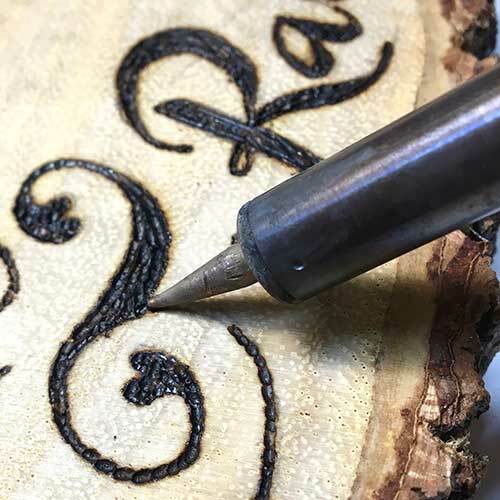 A few screws in the top of the stump will hold it in place. Wrap some tie-wire around, as there was an opening large enough for a hand. It is a sculpture, statement piece. ‘And the plus is that it is portable AND can be adjusted to different configurations! 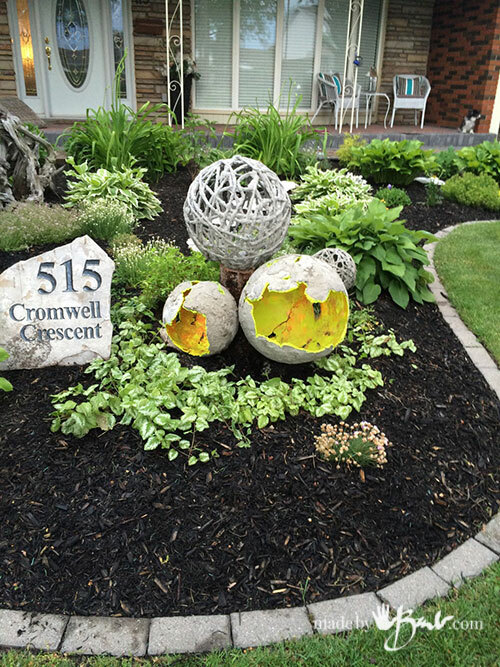 I bet the neighbours were chuckling again… What is ‘crazy garden lady’ doing now?! And what is she rolling around?! When it’s done, it;s all a different story. 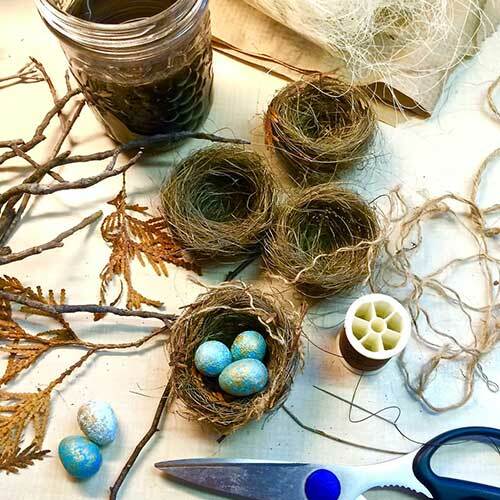 Last time I was cutting branches off the tree until I came upon a nest; and then had to abort! The birds had moved on now and the tree left me a pedestal. I have been eyeing beach balls for the last two summers, wondering if they would work for this kind of application. I always love your projects, but this one is just like you and I were channeling the same stars (or something). Thank you for being the brave lead experimenter for the rest of us. That’s funny! I’m glad to help. I’ve been feeling a bit crazy lately as I’ve got orbs all over the place. AND I have been perfecting a completely new design that is even more unique… I was even eyeing an exercise ball; even bigger! The biggest obstacle most need to overcome is just the fear of failure. Me, I am the most stubborn and will ‘beat’ it ’til it works out! I would like to know with the beach balls did you deflate them to get them out? Thank you so much! 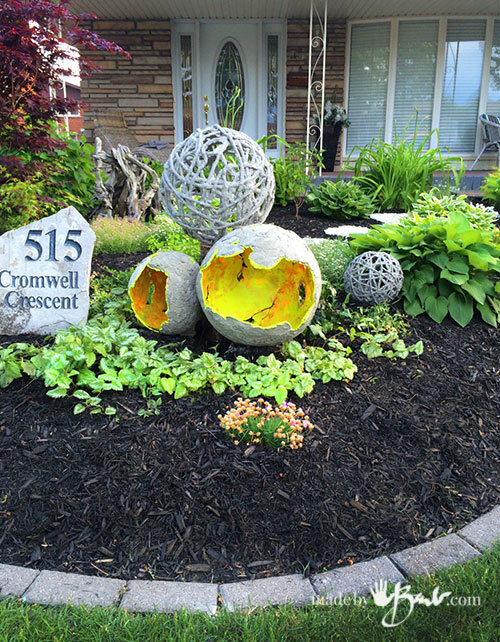 I just love the orbs you made for your garden….wow, what an impact!! I made some smaller balloon orbs for my kids for Christmas this year and gave some to friends. They were awed!! Thankfully I kept three for me and love the look of candles glowing inside which I painted gold. I didn’t use the same mixture are yours unfortunately but am looking forward to trying it. Did you have to screen any aggeragates out of your mixture? Happy orbing trails!! You do fantastic work!! Thanks, I never tired of the orbs. I think I still have one up my sleeve… That mix was a somewhat fast setting one. No, I did not screen out anything. 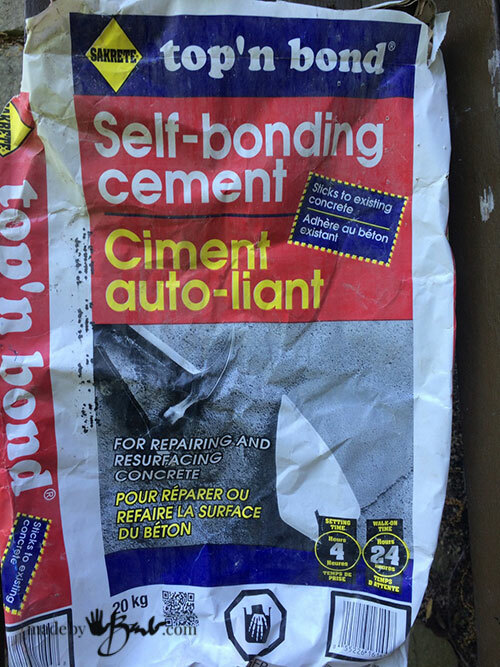 Lately I have been using the RapidSet Cementall which sets so quickly and is really hard. 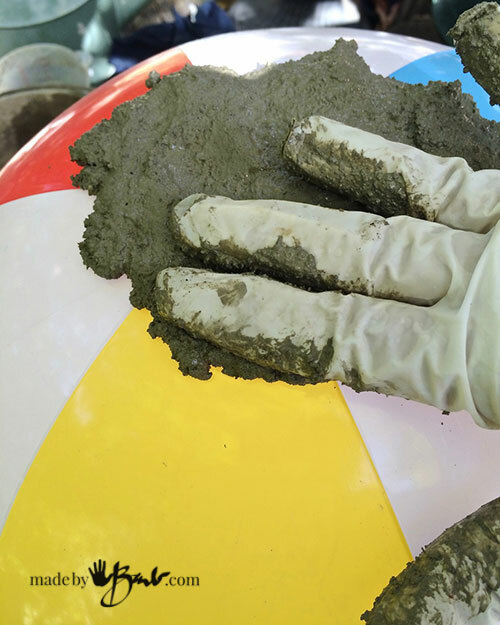 It is a much finer concrete. I think you referring to the ‘Eggs’ which I love too! The use of leaves in this one is also fun. Happy concreting! such beautiful and original works of art. 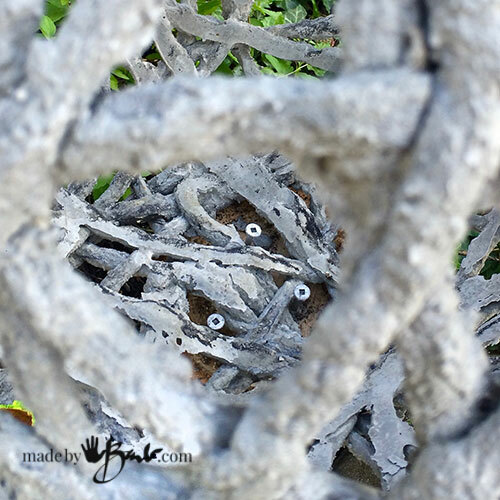 I’ll be creating my own concrete art soon. Great! Thanks! 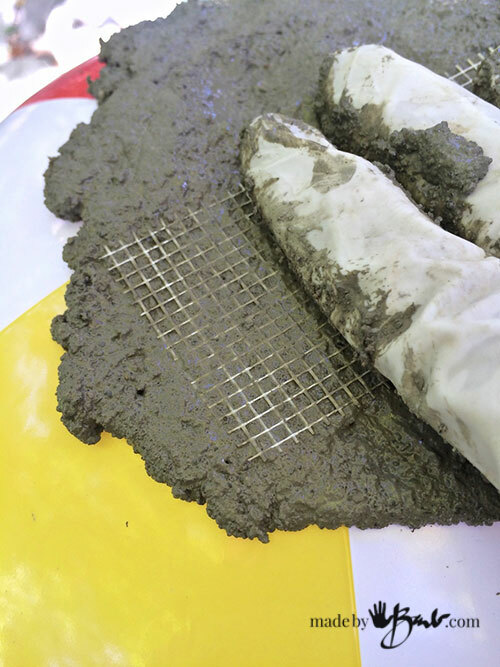 It has finally gotten warm enough to think about outdoor concreting again! Great info. ..want to make one soon. 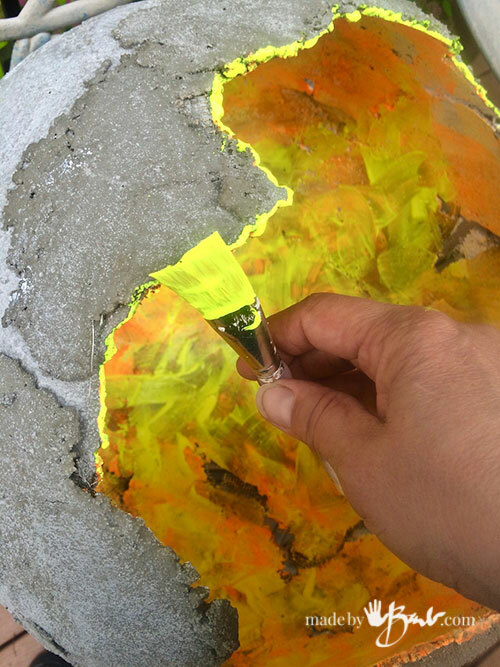 What type of “neon” paint did you use? Will it withstand below 0 temperatures? Thanks for any info. Love your posts!! Thanks for sharing. Thanks! 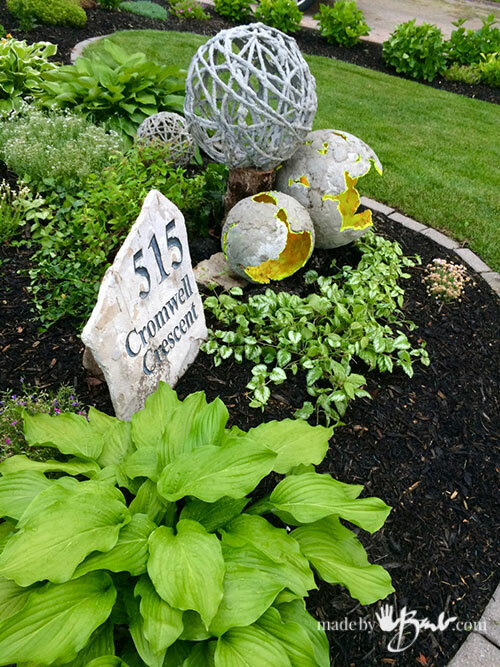 I’ve had these orbs in my garden for over a year and they are still holding strong. I used a normal acrylic paint but there is an outdoor craft acrylic as well. 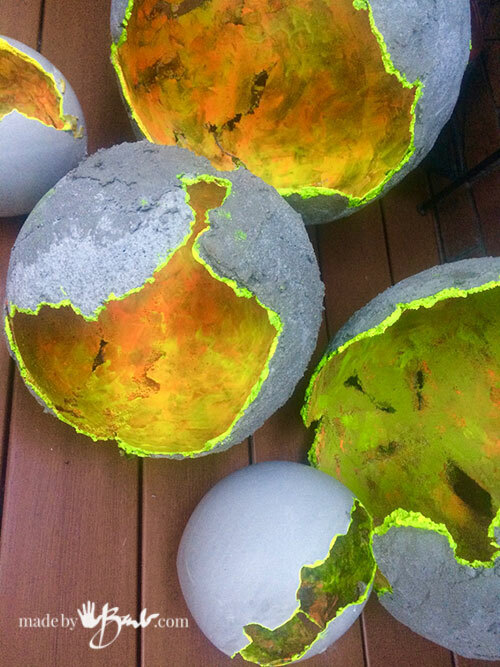 I have things kicking around the yard like painted rocks and rusted shovel art that have held on for longer than I can remember when I painted them! The key is not too thick and avoid constant wet conditions. Hello!! I’m a little late to the game. I’ve been avoiding Pinterest like the plague but just got hooked in my accident. Ha!! I am so in love with your concrete everything. I’m wondering, with the orbs, can they have plants in them as well? I have a weird, maybe unhealthy, obsession with moss. 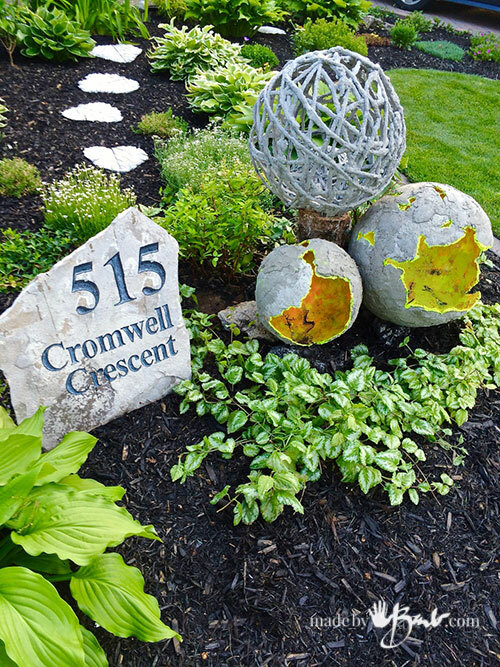 I’m thinking large garden orbs with moss inside them. Thoughts? I just don’t want to create something and have the moist soil and plant matter breakdown the orb itself, if that makes sense. Thanks so much!! Yup a bit late… Since you may have missed this orb and this one. I have a few with moss in the shady parts of the garden. Do be aware tough that moss can be somewhat ‘picky’ about where it will be happy. Also do leach out the alkalinity before planting. 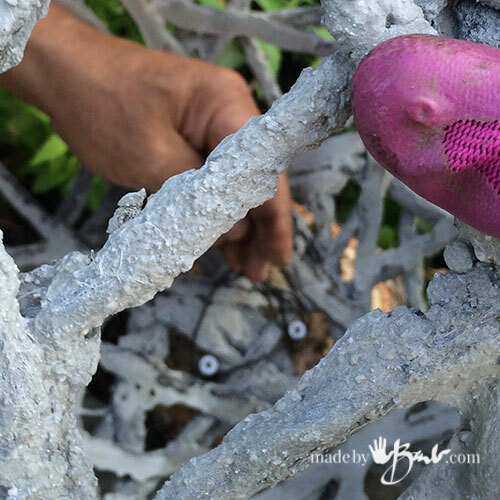 I was going to make some of these as planters too… happy concreting! Wow, maybe you should start with the bowls as they are using a simple (cheap) SandTopping mix and plastic bowls. 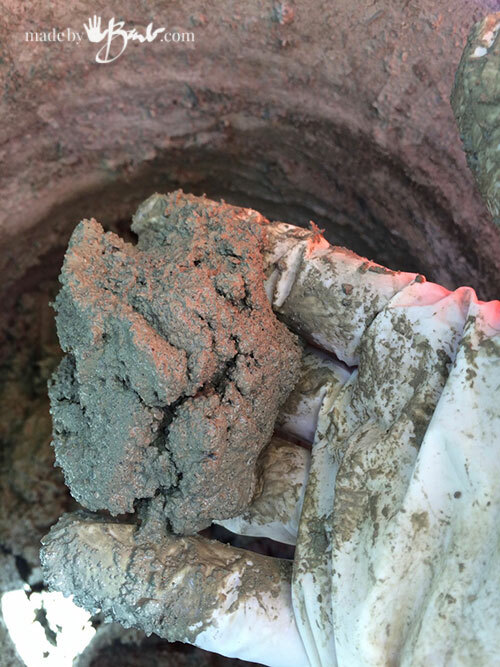 The geodes use a specific strong mix (more expensive) There is a post for working with concrete tips as well as figuring out which mix After you get the hang of it… the sky’s the limit!